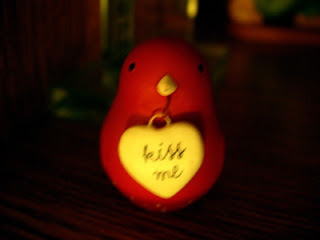 This little red bird is cute holding a little sign that says "Kiss Me". I bought it at Department 56 about 2 years ago, as a gift for my main squeeze, for Valentine's day. There is no visible name on this bird to give credit here to its maker, unfortunately. This is a magical, yet non-Disney, item that I added to the site before I decided to make the site about my Disneyana collection. I hope you like it.